Frequently, as I struggle across the golf course and mumble a few curses at my ineptness at the game, I resort to a bit of weak humor. “They should call this game “If,” I proclaim. It’s often a crutch we use to escape the reality of the situation – but it’s not all bad. Perhaps its real strength is when we use our minds to conjure up possibilities – and then muster the fortitude and commitment to accomplish something. And, doing it without mourning the circumstances of our situation. I think Dale Butler epitomizes this. A classmate of mine, Dale was born with just one full arm and a “stub” for the other. I suppose this was a defining fact when I first met Dale as a kid growing up in Chadron, Nebraska. But that limited view didn’t last long. Kids seem to have a knack of quickly getting beyond the small stuff and focusing on what counts. And for those of us who loved sports, it wasn’t which neighborhood you lived in, or the color of your skin, …or how many arms you had. It was: can you play the game? Dale was an exceptional athlete. And while I suppose it’s natural to speculate about how great he’d have been with two arms, I’m here to tell you he was great with one arm! And I don’t think any of us who grew up with Dale thought of him as “handicapped” in any way. We thought of him as, well, Dale. In sandlot baseball “workup” games, I remember Dale being among the first choices for a teammate. Each of us is motivated in different ways. As a kid, I was competitive and worked hard to be as good a basketball player as Larry Matthesen, one of the best ball handlers and shooters ever to come out of Chadron High. I suspect Dale may have been motivated in his own way to achieve excellence. Perhaps the most important factor in shaping our character is our parents. Dale was blessed with a nuturing home life. I’m certain that parental vision, strength, and commitment helped Dale Butler and his brothers to succeed – not just in sandlot baseball and neighborhood basketball games – but in life. And Dale has certainly done that. 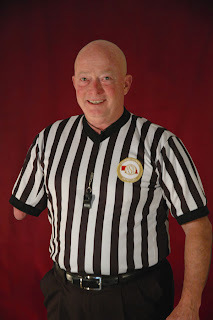 While many of us have been sports spectators perched in front of our television sets after work, Dale has been active officiating basketball, football, and baseball games over the past four decades. Good friend Con Marshall has crafted this excellent story about Dale’s recent selection to the Nebraska Athletic Hall of Fame. It’s just one measure of Dale’s success. We’re happy to have been a part of his early years, and we’ve admired his many accomplishments in education, business, and life! Warm congratulations are due Dale for his accomplishments. Well done, good friend, and best wishes to you, Carol, and your family!